It was announced today that Northborough, Massachusetts–a town that sits in the center of the sprawling web of suburbia between Boston and Worcester–will soon be getting one of the franchise “Loop” concept shopping centers. Named after Massachusetts highway 213, which completes a freeway “loop” around the city of Lawrence, it’s a particularly odd choice to use to name an entire string of centers in faraway places like Kissimmee, Florida. 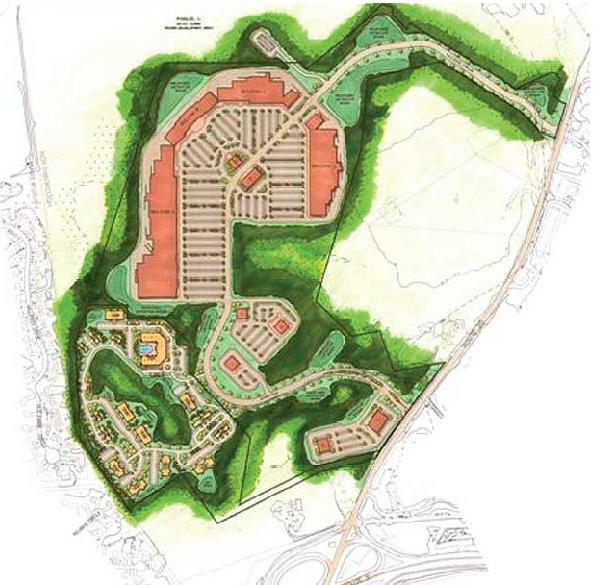 While The Loop Northborough will include a housing component, the site plan (available on the website, and reproduced below) reveals that, bar the presence of a few gazebos and decorative lamp posts, the center is (much like its namesake twin in Methuen) really just a strip mall. I suppose that labeling this a “lifestyle center” helps move it through the permitting process, since these centers aren’t yet as demonized as malls, big box centers, or strip malls. Still, is it really that much to ask that they deliver on their promise? I’ve seen centers that are well-done, with shops organized along a main street promenade (such as Main Street at Exton, in Exton, Pennsylvania), but this is really little more than a strip mall disengenuously being sold as “pedestrian friendly” or, somewhat laughably, as an “inspired streetscape design, [with] wide sidewalks, custom storefronts with colorful awnings, [and] plentiful landscaping.” Furthermore, the site seems to imply that there is a lack of true “pedestrian friendly” shopping in the area, despite that the massive Solomon Pond Mall opened just a few miles away in Marlborough ten years ago. I’m certain some of this is true, but the plot plan shows long rows of stores facing inward towards a sea of parking. How is this evocative of small-town America, or friendly to pedestrians? The caveat is that, at least according to the artists’ renderings, it will have attractive storefronts and wider sidewalks to accomodate pedestrians, so I may yet be convinced. But at least for now, you can color me unimpressed. It may be worth noting, also, that 213 was renamed the “Loop Connector” after construction of the shopping center. MassHighway simply moved the 213 shields over on the sign gantries and overlaid “Loop Connector” to the right of the shields. The only other indications of the name are signs at each terminus. look how much space the parking lots takes up,so uninspiring. Kyle, stop being a jerk. I have to say, I can not agree with you in 100%, but it’s just my opinion, which indeed could be wrong. p.s. You have a very good template . Where have you got it from? Has any contruction started on this project yet ? So far from the center of town… you must drive there, so only then you can walk around [and spend money] in uninspiring mega-chain stores? What a perfectly good waste of forest. It is Northborough Center that needs invigoration and pedestrianized walkways! It has decayed to an angry mob of traffic and a blob of gas stations. Not even a restaurant to be found until you go a mile or more out of the center.